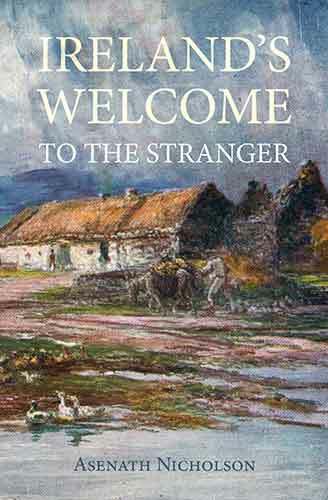 When returning, we met a peasant girl, with her dress turned over her head, who in the most earnest manner spoke in Irish, and beckoned us to go further. We declined, and she changed her laughing look for one of pitiful endearing disappointment, which prevailed with me, and I said, "We will go." She exultingly bounded away, leading us forward, looking back to encourage us, for the way was precipitous and somewhat difficult, till she placed us upon an awfully grand precipice. Here she stopped, and, in the most animated manner, pointed us down, then to a mountain across the channel, then to the golden stripes of the sun upon the water, then to the sea-gulls, then to the eastern sky, which was extremely beautiful; and when she saw we understood and were pleased, she was delighted. Had she been a well-educated girl, she could not have displayed more taste for the sublime and beautiful. She was pretty in look and graceful in manner, and when we parted, and saw her entering the mud-wall cabin, a companion of pigs, with no employment but feeding them and milking a goat, or gathering turf from some bog, we said, what a pity that such an intellect should be lost, and who must account for all this waste? What a pity that government or aristocratic pride should place barriers to the improvement of the talented poor. In no civilized nation, probably, is there more waste of mind than in Ireland. Should any dispute this, let him visit the county of Kerry. The wild children there among the mountains, who spend their time in herding cattle, often show the quickest perception of all that is lovely in nature, and will answer your questions with a clearness that would do honor to a refined people.